Many more combinations are possible than are circulating in the blood at any one time, and these cells are being recycled throughout life. The system generates variation in a combinatorial way, but it need not be exhaustive: tiny voles and huge elephants have essentially the same immune diversity, with orders of magnitude differences in the number of lymphocytes they can circulate. There are no major differences in adaptive immunity associated with life span or body size in higher vertebrates (and fish can live very long lives). For most pathogens, the millions of antibodies present at any time appear to be sufficient to ensure that enough cells recognize the specific pathogen that the body can mount an effective defense. Thus the system is not limited by these factors (or it is not as important for survival as we tend to think). Note that the immune memory that an individual develops during its lifetime is not genetically inherited (or at most is inherited in the limited extent of temporary effects of transplacental resistance from mammalian mothers to children). What is inherited is the (randomly mutated) germline repertoire and the sloppy recombination process from which any new attack is mounted. As currently understood, each new individual must generate its own set of specific antibody molecules. It starts fresh, but the mechanism is such that this is not a particular handicap relative to its benefits; and to a considerable extent, the pathogenic environment is always evolving anyway. The system is powerful but neither necessary nor perfect; most animals do not have such a system, so it is clearly not a prerequisite for survival or "adapting" to a world filled with tiny, hungry pathogens. Also, as noted earlier, we live in commen-salism with many microparasites (indeed, we could not survive without them, as illustrated by the need in vertebrates for bacterial colonization of the gut to aid in various stages of digestion; usually, these stay out of the body, where they are less vulnerable to immune attack) and, despite effective immune defense, more animals of many species may be killed by micropredation than by any other single cause. When cell surface receptors on lymphocytes bind to lipopolysaccharide (LPS), a component of Gram-negative bacterial cell walls, peptidoglycan (PGN) from the cell wall of Gram-positive bacteria, or interleukinl (IL1), this initiates a signal-transduction pathway, triggered by Toll-like receptors, (TLRs), which releases a TF, NFkB, from its inhibitor IkB (see Figure 11-9). This allows NFkB to enter the nucleus and bind to various promoters, activating genes involved in adaptive immunity as well as proinflammatory molecules, cytokines, that signal between cells during an immune response. Tlr4, with additional factors, is required to sense LPS, whereas the Tlr2 gene product is required to sense PGN (Takeuchi and Akira 2001; Takeuchi et al. 1999). TLRs, a family of leucine-rich proteins, are homologous to Drosophila Toll protein, a membrane receptor that is also thought to function in insect microbe recognition, as well as being used in the development of dorsoven-tral patterning in flies as we saw in Chapter 9, among other functions. Figure 11-9. Toll and Toll-like signaling pathways in humans (left) and Drosophila (right). In human lymphocytes, the IL1 receptor phosphorylates IkB via the IRAK kinase cascade, the homolog of the Drosophila Pelle cascade. 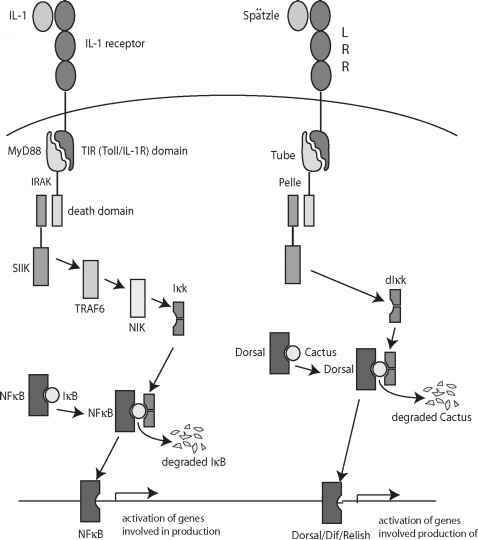 Once phosphorylated, the IkB protein (the Drosophila homolog is Cactus) is degraded, which allows the human transcription factor coded by NFkB (Dorsal in the fly), to enter the nucleus where it regulates the transcription of lymphocyte specific genes involved in the immune response. In flies, the same pathway effects dorsoventral patterning during development and the transcription of antimicrobial proteins in adults. at bay while the adaptive immune system geared up to properly defend the organism. This was always a bit of a forced argument since most species keep pathogens "at bay" indefinitely by their innate system (since they have no adaptive system). The adaptive system was tailored so that it responded to characteristics of invading cells that were not found in the host's own cells (bacteria, for example, have different components of their cell walls compared with animal cells). According to this view, the adaptive response is more recent, more highly evolved, and (to scientists) much more interesting. More recently, however, there has been discussion of the role of the innate immune system in eliciting and regulating the adaptive response (Hoffmann et al. 1999; Janeway 2001; Medzhitov and Janeway 1997; 1998). Again, we should not be surprised if a newer, but related, system is connected developmentally with its still-present predecessor. Janeway and his colleagues have proposed that the adaptive immune system is activated by a signal from the innate response. 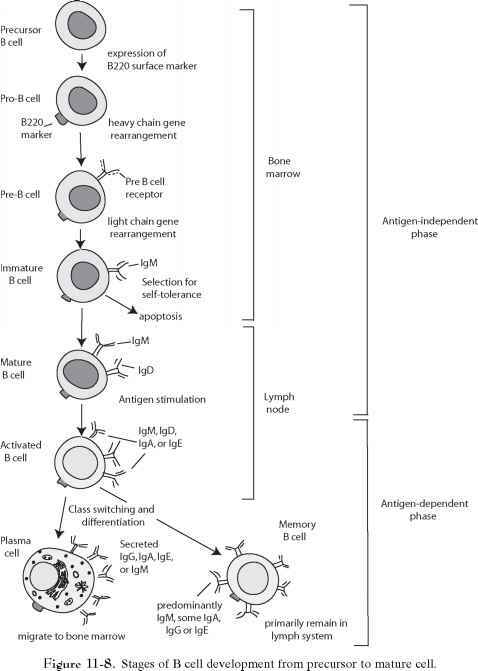 The innate immune system induces the expression of costimulator molecules on antigen-presenting cells, and without this costimula-tory signal there can be no recognition of antigen by T or B cells, and thus no clonal expansion of the specific antigen-recognizing cell. These costimulatory signals are based on the innate immune system's ability to use what Medzhitov and Janeway (Medzhitov and Janeway 2000) have called PRRs (pattern recognition receptors) to detect PAMPs (pathogen-associated molecular patterns) on invading cells, of which there are many known examples (e.g., Bauer et al. 2001; Moriwaki et al. 2001). PRRs are encoded by host genes and are specific to common molecular signals on pathogens because, these authors suggest, PRRs have coevolved with pathogens whose PAMPs are molecular structures so crucial to the pathogen that they cannot mutate to avoid detection without fatal consequences to themselves (Medzhitov and Janeway 1997). PRRs are found on the surfaces of host cells likely to be the first to encounter pathogens, such as mucosal membranes or surface epithelia as well as other types of cells of the innate immune system. We will see relevant comparisons in plant immunity below and later in Chapter 13 in relation to olfaction versus pheromone reception. Because the V(D)J system can produce an effectively unlimited variety of antibodies, it can be expected also to produce antigens against the cells of the host's own proteins. However, if the innate induction theory of adaptive immunity is correct, then lymphocytes carrying anti-self antibodies would not destroy self proteins because a second costimulatory signal is required for lymphocyte stimulation and self proteins do not have a recognizable costimulatory molecule capable of sending this signal. 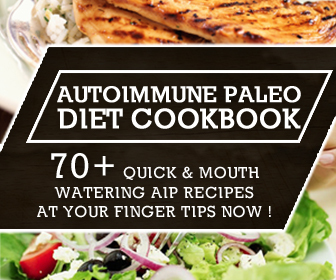 The existence of autoimmune diseases, however, perhaps weakens this idea to some extent. Human examples of autoimmunity include many life-threatening diseases: type 1 (juvenile) diabetes mellitus in which the host destroys its own pancreas, the nerve demyelination disease multiple sclerosis, systemic lupus erythe-matosus, which attacks a variety of organs, and many others. However, these may not simply reflect aberrant anti-self attack, because there is some evidence that they occur with various epidemic patterns in populations, including after the host has experienced an infection. An idea has been that some infections can closely mimic self antigens and the similarity triggers an autoimmune reaction as a consequence of an attack on the infectious agent. In any case, the mechanism by which purging of self-recognition molecules is controlled, once thought to be known, seems now not to be so well understood. To some immunobiologists, the self/nonself dichotomy, however explained, does nothing to further our understanding of how the immune system works, or of its evolutionary origins. Such categorization is a human concept, not necessarily a function of the immune system as it actually evolved. The host itself is always changing depending on its developmental stage, response to environment, somatic mutation, and the like. What is "self"? How would a host be programmed to detect somatic mutation as not "self"? Should it be programmed? In addition, the host may be large enough to withstand attack on itself so long as the latter is triggered by a genuine exogenous invasion that is cleared before too much host is self-destroyed. That the system occasionally goes awry, sometimes with lethal consequences, is not unique to immunity (and many of the known autoimmune diseases generally kill postreproductively). We do not really know why an adaptive system was favored, but clearly it was not "needed" in any ultimate sense. A system that worked well enough to combat infection better than its predecessor or competitor (in some environment that vertebrates may have had to suffer through) would tolerate the evolution of an adaptive system that simply was not too aggressive against self. In fact, given the rapidity of evolution of pathogens, the diversity of vertebrate cell types, and the often rather loose screening by selection, it may not be surprising that the system is only rather loosely discriminatory between self and nonself. If you live long enough to reproduce, evolution does not care, or even see, whether you destroy yourself subsequently or not. Another view is that the adaptive system may have evolved to maintain the somatic integrity of the individual and only incidentally reacts against exogenous pathogens.The immune system could thus be viewed as a messy "dialogue" between the body and the cells of the immune complex (Cohen 2000). According to this view, autoimmune T cells in fact contribute to body maintenance, and play a role in maintaining the central nervous system (CNS) (Moalem et al. 1999): autoimmune T cells, reacting to myelin antigens, protect the CNS against posttrauma secondary degeneration by reducing nerve conductivity, which allows the nerve to heal. The same cells can also attack the CNS, causing disease, but the point is that autoimmune T cells are found in healthy individuals, as well as those with autoimmune disease. This, Cohen suggests, is because the business of the immune system is to maintain the body, not to discriminate between self and nonself. That such a system would, once around, come to be useful against exogenous molecular variants is not a surprising side benefit. Such discrimination may be a dispensable luxury (and was, for most of the history of evolution), if the immune reaction is timely and tempered and sufficiently localized and slows down after disposing a particular pathogen. Many vertebrate organ systems use continually renewed epithelia, and this could make the organism vulnerable to ill effects of somatic mutation, but whether this is relevant or not is wholly speculative at present. The discussion of why an organism's immune system does not destroy the host would be a fairly arcane side branch of biology if the understanding did not have such important ramifications for how we go about developing therapies against autoimmune diseases and protecting against rejection of transplanted organs and other such medical problems. Perhaps the most important evolutionary question is why only one tiny branch of the biosphere has developed a complex adaptive system because perhaps 98-99 percent of all multicellular animals do perfectly well with innate response alone. Trees, squid, some insects, and so on are large potential pathogen dinners that often manage to live a very long time. Other defense mechanisms also exist. 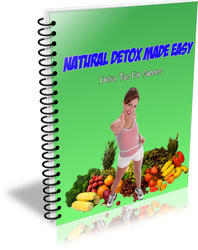 One source of exogenous molecular attack is from the nonbiological world of chemicals. Many chemicals to which an organism can be exposed through the air, food, or other means may not amplify by growing within the host, but may react in damaging ways with the organism's own biochemistry. There are a number of metabolic systems that serve to inactivate or detoxify exogenous molecules that have certain properties. As an example, the cytochrome P450 (CYP) genes serve this function (the name comes from the history of the discovery of these enzymes). Cytochrome P450s comprise a phylogenetically old class of heme-containing monooxygenases largely expressed in the liver that function to detoxify xenobiotic (exogenous) hydrocarbon molecules. The class of CYP genes appears to have evolved from related steroidogenic ancestral genes at the time of the separation of animals and plants (the latter are still found in prokaryotes and are expressed on mitochondrial and other intracellular membranes, where they help synthesize steroids and other substances used to maintain cell wall integrity). CYP response works by catalyzing the oxidation of xenobiotic substances, which, along with other reactions, makes them more water soluble and excretable as well as inactivating them. The diversity of CYP genes in animals suggests that the system may mainly have evolved to combat substances derived from plants, in an animal-plant predator-prey competition. CYP genes are mainly active in the liver but, like many large, old gene families, have other sites of activity and probably other functions. The genes are important in human responses to the environment but, ironically, can turn harmless humanmade substances into toxic ones and can inactivate medicines or make them toxic. So the system has many facets when it comes to human affairs.